In tomography, slight differences between the geometry of the scanner hardware and the geometric model used in the reconstruction lead to alignment artifacts. To exploit high-resolution detectors used in many applications of tomography, alignment of the projection data is essential. Markerless alignment algorithms are the preferred choice over alignment with markers, in case a fully automatic tomography pipeline is required. Moreover, marker based alignment is often not feasible or even possible. At the same time, markerless alignment methods often fail in scenarios where only a small number of projections are available. In this case, the angular separation between projection images is large and therefore the correlation between them is low. This is a property that most markerless algorithms rely on. The intermediate reconstruction problem of alignment by projection matching is highly underdetermined in the limited data case. Therefore, we propose a projection matching method that incorporates prior knowledge of the ground truth. We focus on reconstructing binary volumes. A discrete tomography algorithm is employed to generate intermediate reconstructions. This type of reconstruction algorithm does not rely heavily on correlated projection images. 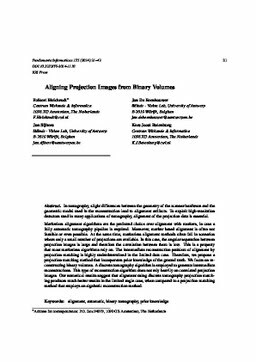 Our numerical results suggest that alignment using discrete tomography projection matching produces much better results in the limited angle case, when compared to a projection matching method that employs an algebraic reconstruction method.